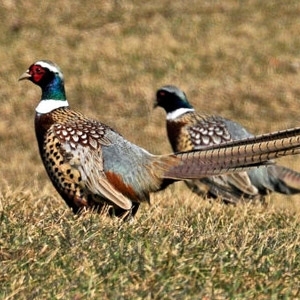 Baby Pheasants, Chukar, and Quail require a brooder temperature of approximately 95 degrees for the first week, dropping approximately 5 degrees every 3 days or so until the end of the brooding period. They will feather out quickly, so they do not require as much heat as chickens and turkeys. 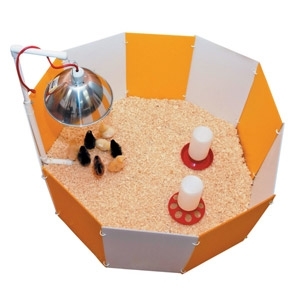 Gamebirds are strong fliers, so the brooder should be covered after they reach approximately one week of age, as they will fly up when startled. 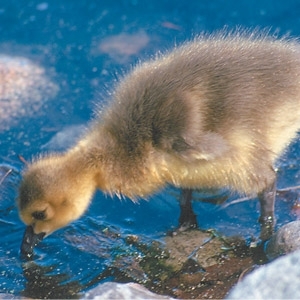 Waterfowl babies don't need as much warmth as other birds, but they do need a little extra warmth, especially at night, for the first week to 10 days. Goslings like their feed wet, and adding a little water to the feed (so it is somewhat soupy) helps to keep them from choking. They will also also appreciate fresh greens daily, and bugs and meal worms are a special treat. Sprinkle finely chopped greens in their water to keep them fresh and clean, as they will not eat dirty or wilted feed. Once they are fully feathered, they will appreciate some swimming water. Turkey poults love heat. 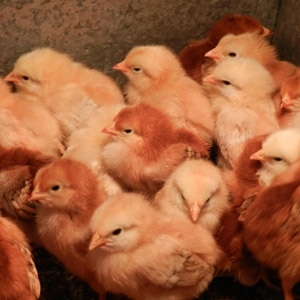 They will be happiest if you keep their brooder temperature at 95-100 degrees for the first week, then lower the temperature by about 5 degrees per week until they are fully feathered, approximately 6-8 weeks old. 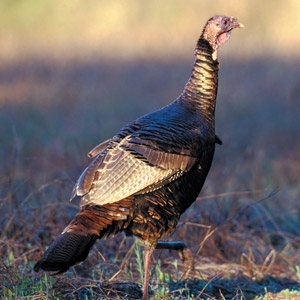 Turkeys are very personable birds and you can easily teach them to eat out of your hand, come to your call, and they will often follow you around, begging for treats and attention. The more you handle them, the tamer they will become. 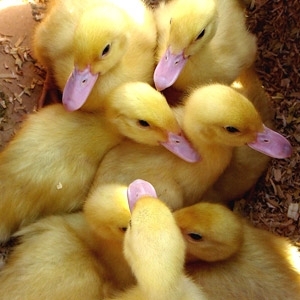 Ducklings that have just hatched from their shells need a warm, safe environment to grow up strong and healthy. If you create a home free of hazards and provide them with plenty of food and water, your curious, playful baby ducks will be able to waddle and swim on their own before you know it! Tending young chicks isn’t difficult, nor need it be elaborate. 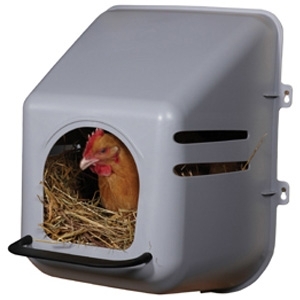 As well as chick starter and clean water, they need a draft-free brooder pen with a red brooder lamp on at all times. Raising baby chicks from the start is an extremely rewarding experience, as you can watch them grow from chirping balls of fluff to egg-bearing, full-feathered ladies. 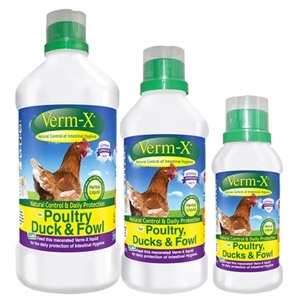 Verm-X® is a 100% natural formulation that helps maintain all areas of intestinal hygiene whilst being gentle on the animal’s gut and digestive system. 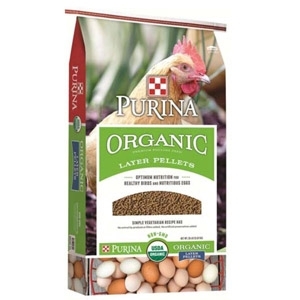 If your birds are kept free-range their drinking water can be hard to monitor, in this situation the pellets offer a great alternative as they can easily be mixed into feed. 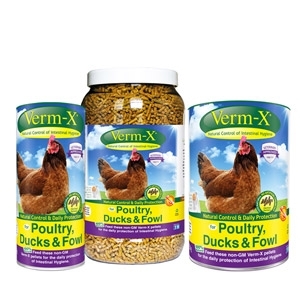 Verm-X® is a 100% natural formulation that helps maintain all areas of intestinal hygiene whilst being gentle on the animal’s gut and digestive system. Our liquid formulation was our first and is added to drinking water or can be soaked into bread and fed directly. 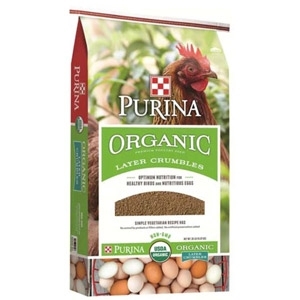 Expertly designed and formulated layer feed for natural, balanced nutrition to support production of fresh, hard-shelled eggs in free-range and home-raised flocks. 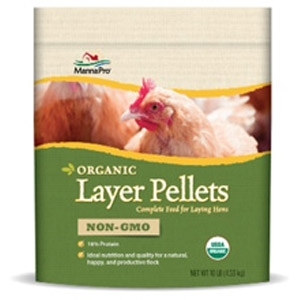 A complete, nutritious vegetarian diet for layer chickens —no need for supplementation. 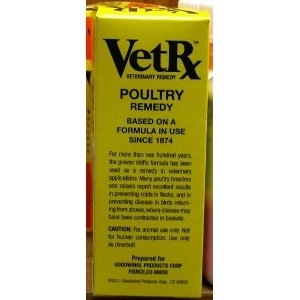 16% protein and fortified with vitamins and minerals to promote hen health and egg production. Help support optimal health in your baby chicks by providing Life-Lytes™ vitamin and electrolyte supplement in their drinking water. Manna Pro’s unique formula comes in ready-to-use tablets that can easily be mixed into a quart of fresh water using the provided mixing bottle. 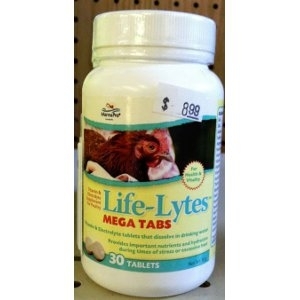 Life-Lytes is the ideal addition to your chick care regimen. Let this chicken cage, cage your chickens! 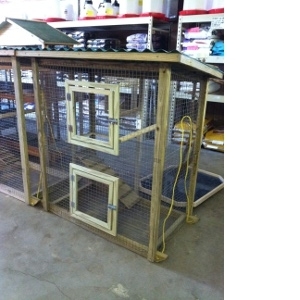 If you don’t want them roaming keep them safe and secure in this cage with enough room for any chicken to be content! 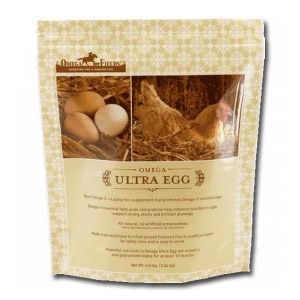 Increases Omega-3 levels in eggs. Supports brilliant, high-quality plumage. 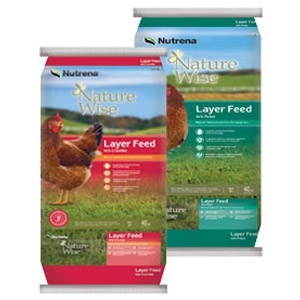 Improves laying rates, flock health, and spent hen value. Preserves egg flavor, aroma, and nutritional value. ALL NATURAL without artificial preservatives. Naturally occurring amino acids – valuable protein building blocks. Formulated with stabilized, ground, whole flaxseed high in Omega-3, folic acid, vitamin E, and vitamin B-12 using proprietary technology to maintain full nutritional value, guaranteed for 12 months. Poultry Protector™ is an all-natural solution to the common problem of mites, lice, fleas and ticks within the backyard flock. 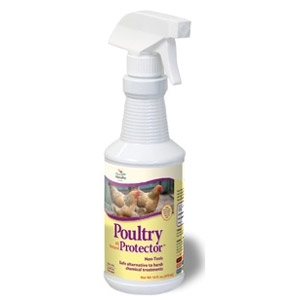 The natural enzymes in Poultry Protector clean away these pesky bugs safely, without the use of harsh chemicals found in so many other insect treatment products. Ridding the coop of these pests helps reduce stress and makes your birds more comfortable so they can do what they do best: lay beautiful eggs, grow and flourish. Available in a 16 oz. Ready-to-Use spray, or a 33.9 oz. Concentrate. Bantams, Ducks, Turkeys, Geese and Game Birds. For Internal and External Applications. 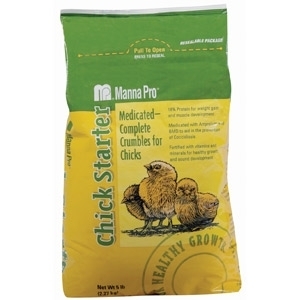 Chick Starter Medicated CrmbleManna Pro Chick Starter is formulated for the development of active immunity to coccidiosis and for increased rate of weight. 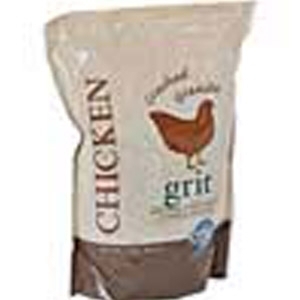 Purina Mills Nutri-Source Chick Grit is a crushed granite chick grit that helps assure healthy digestion in chicks. 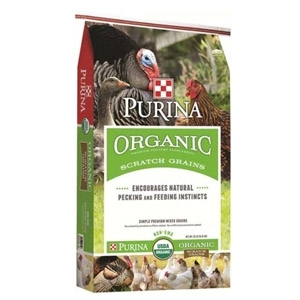 Provide free choice next to feed or mix 1lb with 20lbs of feed. 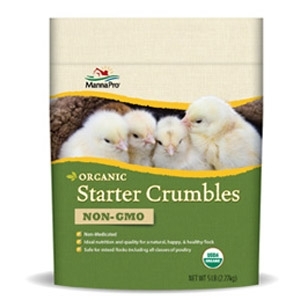 Provide to young birds up to 10 weeks of age. Use only as directed. 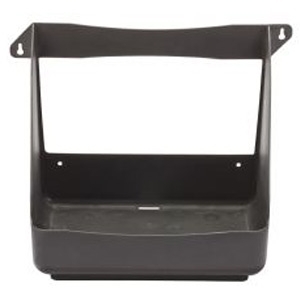 If an excessive amount of grit accumulates in the feed troughs, reduce the amount added.